Posted on Monday, June 11, 2018 by "T". Back in 2015, Daniel Ospina finished runner-up (second place) in the WSOP $1,500 No-Limit Hold'em Deuce-to-Seven Lowball event. Little did he knew that three years after, this 2018 is going to be the year that he will finally get his very first gold bracelet and he'll be the first WSOP bracelet winner for his home country, Colombia. Daniel Ospina outlasted a field of 260 players in Event #14: $1,500 No-Limit 2-7 Lowball Draw for $87,678. He knocked off Timothy Mcdermott in a heads-up battle to earn his very first WSOP gold bracelet. 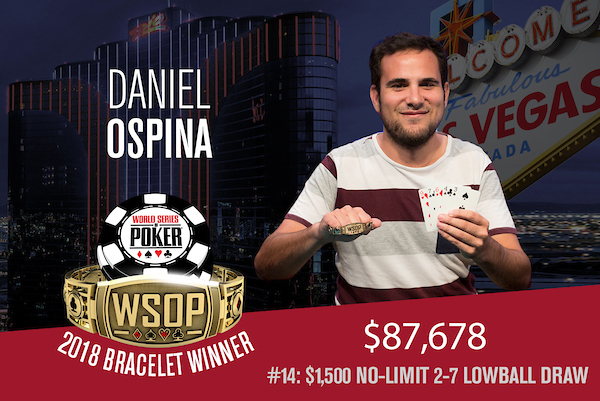 Also for WSOP's record books, not only is this Ospina's first bracelet, but it's also the first bracelet win for the country of Colombia too. After he won, Ospina and his rail proudly posed for a photo with the Colombian flag. There was a story to the flag, as Ospina said, "I was walking through the airport to catch my flight to Vegas when I noticed one of those Colombian gift shops. My first thought was, oh I'll need a flag for when I win a bracelet and I don't think I could find one in Vegas, so I bought it and here we are." About his win on this event, he said, "I just really felt like it was my time, I never really doubted myself and felt like everything was coming full circle. I've actually been taking some time off poker in the past couple of years. There was a point where I wasn't really sure if I was going to go back to it or not. But to win today after my second place a few years ago just means the world to me. I feel like back then I wasn't really mentally ready in a lot of ways and I feel like today means so much more to me than it would have back then." 4 comments for "2018 WSOP: Event #14: $1,500 No-Limit 2-7 Lowball Draw won by Daniel Ospina, the First Colombian ever to win a WSOP event, for $87,678"
Deuce to Seven Lowball Draw? I have no idea what that is. Massive well done to Daniel Ospina for topping a field of 260 players to win the US$1,500 buy-in no-limit Deuce to Seven Lowball Draw tournament. Congratulations also to Shaun Deeb on his third-place finish in the tournament.